In UK properties the hatch to the loft is usually located above the second floor landing and, even when using the loft simply for storage, will need enlarging if they are to be used regularly. It is unlikely that the existing access to the roof space will be large enough for any kind of loft conversion and fitting a ladder will almost certainly require the access hole to be enlarged. This is a task which can be completed quickly and easily. 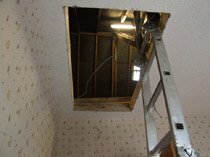 Fitting or enlarging a hatch or roof access hole to accommodate a new loft ladder is essential if you plan to use the attic for light storage. 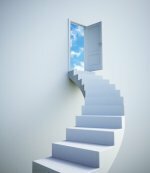 It should be pointed out that any project other than for storage will require permanent stairs and must comply with the building regs. Before starting work on enlarging the access hole check that there is sufficient headroom in the roof above the existing opening for the ladder to be fitted and stored when not in use. 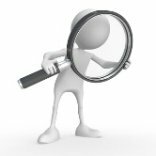 For this reason it is practical to first purchase a new ladder as the manufacturer usually states the recommended size of the opening on the packaging so you will know exactly the dimensions that you need for the newly enlarged access. In some circumstances it may be necessary to cut away (a very small) part of a joist to create the room for an enlarged lhatch, needless to say extreme care should be taken here - consult a joinner if in any doubt. In most modern houses the existing access will not be large enough for a ladder and so will need to be enlarged. This can be done quite easily by firstly marking the area of plasterboard to be cut by piercing the ceiling from above. Then, cut away the plasterboard before removing and replacing the existing trimmers (the lengths of timber which form the two ends of the door hatch by fitting squarely between the joists). Creating a new roof access hole, rather than simply enlarging an existing one, will take more time. Try to ensure the position of the new loft hatch is easily accessible and that the ladder will reach the floor when fully extended. The usual positioning of roof access above the second floor landing is the most practical solution. 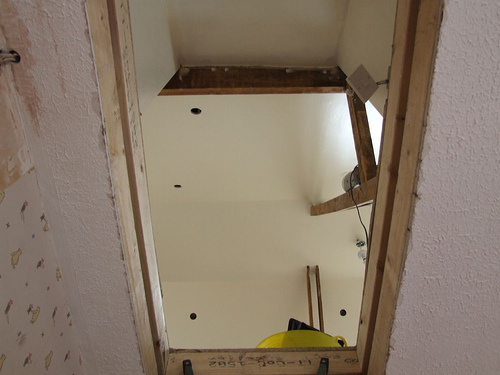 Working from a ladder punch through the ceiling using a tool such as a bradawl to find the joists before cutting a small access hole in the plasterboard. This hole should only be big enough to allow you to see in the roof space. Using a powerful torch ensure there are no electrical cables or other obstructions before enlarging the access hole and climbing into the roof. Don’t attempt any further work until you have placed planks or boards across the joists to make a platform from which you can work. Safety first. Having already made one hole in the plasterboard you don’t want to make another one by over-balancing on a joist and putting your foot through the ceiling! Working from your secure platform cut back the joists where necessary (a couple of inches should suffice) so that the trimmers can be fitted. Once the trimmers are in place you then need to nail the timber linings onto the trimmers before finishing off the newly enlarged loft access with a mitred architrave. Hinging the loft hatch on the lining will be necessary in order to fit a loft ladder. Once this is done the job is complete and ready for installing the loft ladder. But, if the original hatch is of sufficient size to be used as is, and normally only large older houses will have sufficient access, then simply fitting hinges onto the existing hatch will be all that is required. If not, new loft hatches can be easily made from a sheet of MDF cut to size (at least 19mm thick) but it must be protected with insulation and comply with the building regulations. Read more here on the best ways to fit the hatch. If using a concertina style loft ladder the hatch may not be easily insulated because of the fitting of the attached ladder. If this is the case a solution is use an insulated box which sits over the ladder when it is not in use. 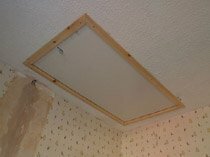 When laying insulation in the roof space a loft hatch needs to be treated separately because, being movable, they cannot just have blanket insulation placed on top. A method which has often being used in the past was to nail an old sheet over the insulation but a far better, and cleaner looking solution to the problem, is to create a simple box to create a receptacle in which the insulation can be contained. And, building the box, is a very quick and easy job. It’s a job which needs to be done because the hatch must be insulated to ensure maximum energy saving efficiency. To make the box simply cut four pieces of sawn timber (either 4 or 5x1 inches) and nail into position on the four upper sides of the loft hatch to create an open ended box. Insulation material, either blanket or loose fill can then be placed inside the box. Enclose the box by nailing a thin sheet of plywood over the top. This creates a fully insulated and sealed unit. It is a very quick and easy job but it is surprising how much different the work will make. The extra insulation will help increase energy efficiency and reduce heat loss. Which in turn will of course lead to lower heating bills - so it is good news all round really. This is one of the small projects that many of us will be easily able to turn our hands too and will repay the effort taken many times over. 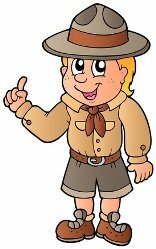 Of course making sure that a loft hatch is fully insulated is no good at all unless the rest of the roof space is laid with proper insulation material under the loft flooring. A recommended alternative to making and insulating your own is to use one of the vast range of pre-manufactured units that are available from a number of companies. Supplied by specialist companies these look very stylish, are easy and practical to fit and, most importantly, are fully compliant with the building regs including the strict fire safety rules. Buying a pre-manufactured / fabricated unit is a great way to not only satisfy the building regulations but they are also aesthetically very pleasing. 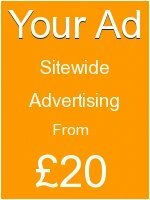 Definitely something to consider as they provide a professional finish for a very low cost. Specialist suppliers have a range of products costing from around £50 depending on the model. Different versions are available depending on the specification of the loft conversion or dimension of the access hole to the roof. They can be purchased as either a package with a loft ladder or separately. They are usually supplied with a white, textured finish, spring-loaded catches and are insulated and sealed. Pre-manufactured units can also be supplied with their own frames which will fit neatly into the enlarged opening you have created and are easily and quickly fitted. They usually require no finishing once they are installed. Usually opened with a pole pre-manufactured loft hatches are also available with locking catches. So, if storing valuable items in the loft, using a lock on the hatch is an excellent added security precaution.